Nibbana is the ultimate goal of the Buddha’s teachings. So what is it exactly? Since I’m far from enlightened, I find it more fruitful to contemplate the ‘born’ instead of the ‘unborn’. What is born? Ultimately, that which is born is a conditioned mind state – the result of ignorant clinging to something that is impermanent, unsatisfactory and not-self. But if I truly understood anicca, dukkha, anatta – like the Buddha did – there would be no clinging to what is gained or lost and therefore no birth into gladness or sorrow. I would see that nothing inside or outside of this body/mind is worth clinging to as ‘I’, ‘me’ or ‘mine’. Ageing, sickness and death would be transcended (as when the Buddha experienced severe and fatal food poisoning, for example). That’s nibbana as I understand it, useful to contemplate as a reminder of the ultimate spiritual goal (escape from samsara) and to motivate one in striving to attain it. 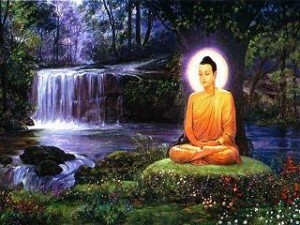 This entry was posted in Sutta and tagged enlightenment, nibbana. Bookmark the permalink.